RFMW PCBs are used in applications where transmission rates are critical. 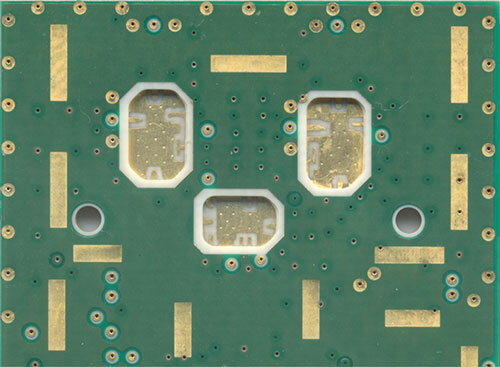 These types of PCBs often incorporate the use of controlled impedance designs as well as PTFE, Ceramic, or other high-speed materials. Common design features include hybrid material constructions, blind & buried vias, backdrilling, and sequential laminations. Faster communications require high speed resin systems for high bandwidth RF applications in the following industries: Military, Telecommunications (power amplifiers and antennas), RFID, DUT Chip testing, Medical and Automotive (radar). Manufacturing challenges typically surround the different types of materials required by the design. Primarily the issues include drilling, multilayer lamination, and plating activation. Our engineering team devised numerous process controls and machine recipes to address these issues such that we are able to produce the most complex designs in short amounts of time. Click here for more.